The Children | A Savings WOW! Could you use a new holiday outfit for your child or a gift card to The Children’s Place? 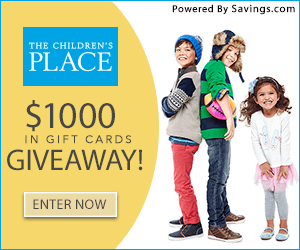 Hurry over to Savings.com and enter to win one of forty (40) $25 gift cards to The Children’s Place! This giveaway is through Friday, November 13th at 11:59 PM ET (or 10:59 PM CT). – The giveaway runs from Monday, November 9th at 12:00 AM ET to Friday, November 13th at 11:59 PM ET. – Forty (40) winners will receive a $25.00 gift card to The Children’s Place. – Users can enter the giveaway by heading to The Children’s Place page on Savings.com and submitting their email address on the form at the top of the page. – The winners will be chosen via a lottery drawing and notified on Tuesday (11/17) via the email address they used to enter.